Hockaday will "assume overall responsibility for the coaching staff and first-team playing squad". 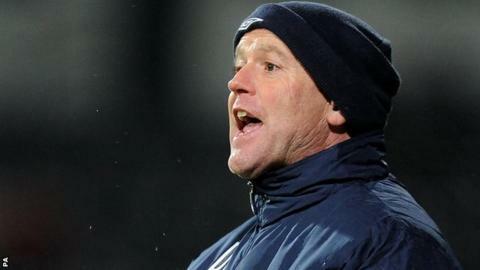 Leeds United have appointed former Forest Green boss Dave Hockaday as their new head coach. The 56-year-old replaces Brian McDermott, who left at the end of May, to become new owner Massimo Cellino's first managerial appointment. Hockaday, who has signed a two-year contract, has been out of the game since leaving the Conference Premier side by mutual consent in October 2013. He will be assisted by former Leicester City midfielder Junior Lewis. Cellino has previously stated that he wanted to appoint a coach to work under a director of football. And a statement on the club website said that Hockaday will "assume overall responsibility for the coaching staff and first-team playing squad with immediate effect". His first competitive game in charge will be their Championship opener at Millwall on Saturday, 9 August. Hockaday said he was excited and looking forward to starting work and dismissed suggestions his appointment was unexpected. "It isn't a surprise because of my background and the fact I'm a very experienced coach and obviously 20 years a player, and the fact that the president wants a very experienced British coach, then I seem to tick all the boxes," he told the club website. "At the end of the day I've been given a great opportunity and I intend to take it in both hands." Hockaday said his remit was "purely the players" but he will have an input into the club's transfer policy. "Everything that goes on the training pitch, everything that goes on on the football pitch, and that's it, it's a simple as that. That suits me, because I'm a coach, it's my passion and my drive. "Everything that goes on in training, all the tactics and the fitness, you're managing players to a degree anyway, and then it's managing the game on a Saturday. For me it makes sense. "I've already talked to the president about a number of players and a number of positions where we need to strengthen, so there will be changes. "Everything I believe in and everything the president believes in, it's about having people on and off the park who are hungry and have a great work ethic. "It's a massive club. Proud doesn't even come close to how I feel, and I will give this club everything I have got." Following McDermott's departure, former Leeds player and boss Gary McAllister was linked with the role, as was Reading youth-team coach Eamonn Dolan. Former Blackpool, Swindon and Hull player Hockaday made his name in coaching at Watford, where he helped to bring through players including Manchester United winger Ashley Young and Algeria international Hameur Bouazza during his time as coach of the under-18 side. He went on to coach at Southampton before being appointed Forest Green boss in September 2009. His first season in charge ended in the club being relegated but they were given a reprieve because of Salisbury's financial irregularities. They stayed up on goal difference in his second campaign, before registering successive 10th-placed finishes. He departed the New Lawn side in October of last year having lost seven of his last eight matches. Cellino wants Leeds, who have not played in the top flight since relegation in 2004, to be competing for promotion from the Championship in the 2015-16 season.